Students scored 3 percent points worse than the class average when they waited until the last day to start their college chemistry homework. Source: “The Early Bird Gets the Grade: How Procrastination Affects Student Scores,” by Hillary Green-Lerman at Knewton. Many college students say they procrastinate because they do their best work under pressure. And there’s usually no way to prove that they’re wrong. But now that more college students are logging onto a computer to do their assignments, data scientists can sometimes measure what the actual cost of procrastination is. In one recent data-mining analysis, researchers from an education technology company found that almost one third of the students they studiedÂ waited until the day before the due date to start their chemistry homework Â (typically weekly problem sets). And these students scored 3 percentage points lower, on average, than their classmates. In other words, if the class average was 88, the procrastinators scored 85. Of course, there were individual bright students who waited until the last moment and still scored well. But the average procrastinator did worse. The sweet spot to start weekly assignments was at least three days before they were due. But fewer than half the students had the discipline to start their work that early in the week. 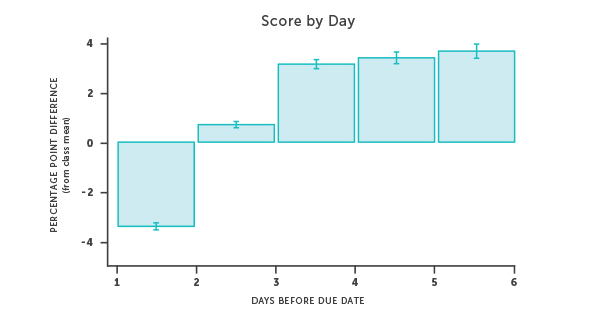 Interestingly,Â students who began even sooner — Â four, five or six days before the due date — scored about the same as the students who gave themselves only three days. “You’d expect the earlier you start, the better you do. But we don’t see that,” said Hillary Green-Lerman, a data scientist at New York-based Knewton, who analyzed homework grades for 5,000 students who were using its educational software across 27 introductory chemistry classes at different colleges. “You don’t do any better for starting six days before it’s due. We don’t know what’s causing that,” Green-Lerman added. The cost to last-minute procrastination echoes what psychologists have previously found in traditional experiments. Joseph Ferrari, a psychology professor at DePaul University, said that students who waited until the last minute thought they did better than they actually did, in his 1993 study. Procrastination is an important issue for companies like Knewton, which develop algorithms to tailor computer instruction to each student’s needs. The company believes that many student behaviors, from boredom to confusion, can play an important role in student achievement, and that they should be factored in to what the computer recommends to a student. Right now, Knewton is still collecting data on procrastination behavior. It hasn’t reprogrammed its algorithms to remind students to start their homework three days before it’s due, for example. This analysis was only for college chemistry, and most of the 325 homework assignments the company looked at were only one week long. It’s likelyÂ that procrastination’s consequences are different in different subjects, or with longer, more complicated projects. But this first glimpse shows that it’s often a modest cost to wait until the last moment, and you don’t need to start on homework too early. Go ahead and play some ultimate frisbee first.